–> First of all, it has to be realized that Ukraine is weakest precisely in the short-term. An election would give Poroshenko a democratic mandate to carry him through the coming years of austerity and economic hardship, after which the situation will inevitably start to look up again (conveniently just in time for the 2018 elections). The pro-Russian electorate is getting older, and is concentrated in the demographically weaker eastern provinces; all else equal, the political power of the European vector is bound to increase over time at the expense of the pro-Russian vector. Meanwhile, passions in Russia over Crimea will die down, and Putin will start becoming preoccupied with the next election cycle. The primary challenge, then, is just to survive the next few months. 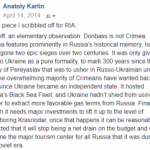 I am assuming that Russia does not want to annex Donetsk – what for? it’s a subsidized rustbelt – but to use it as a lever for federalization, the consequent development of tight links between the SE provinces and Russia, and eventually, possibly, their independence (Novorossiya) or outright annexation. This can be preempted by Kiev offering decentralization itself, but in a manner that minimizes the actual political autonomy offered to the provinces. Incidentally, this is EXACTLY what Yatsenyuk and co. are doing – they are not the naive, limp-wristed fools that many here take them for. Since the current authorities do not enjoy legitimacy in the east, especially in Donetsk/Lugansk, using force now is a pretty stupid idea. Especially since the local siloviki have either defected, or are apathetic. I suppose Kiev can still use units from the far west or mercenaries, but that would be doubling down on the stupid. Let them occupy administrative buildings for the time being, while painting them as foreign agents who don’t represent the will of the people (which is, again, what is actually being done). Administrative functions can be moved elsewhere for the time being. Absolutely no fire orders to avoid giving Moscow any kind of excuse for more overt intervention. Take solace in the fact that, at least before February, the opinion polls showed that no more than a third of Donetsk residents – the most seccesionist province – actually wanted full independence/merging with Russia. In the meantime, all efforts should be focused on stabilizing the economy. 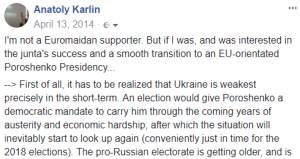 If that doesn’t happen – worse, if Crimea flourishes against this backdrop – then Kiev might have to deal with a Maidan 3.0 before too long, and not in the east but on the streets of the capital itself. How to stabilize the economy? Short of the EU/US putting their money where their mouth is, it will have to open up serious discussions with Russia. And this will require concessions. You might not think that fair, but it’s a fact. At least for the time being, promise to halt EU integration, and pointedly ignore Crimea (don’t accept it as Russian, but also don’t make scenes about it). Yes, this will enrage the Maidan, but unless I seriously underestimate Right Sector’s power, the caretaker government should survive long enough to run the elections and hand the Presidency to Poroshenko.